We have loads of charities in need of items sewn with love. If you are sewing at home click here for a list of charities and patterns from around the country. 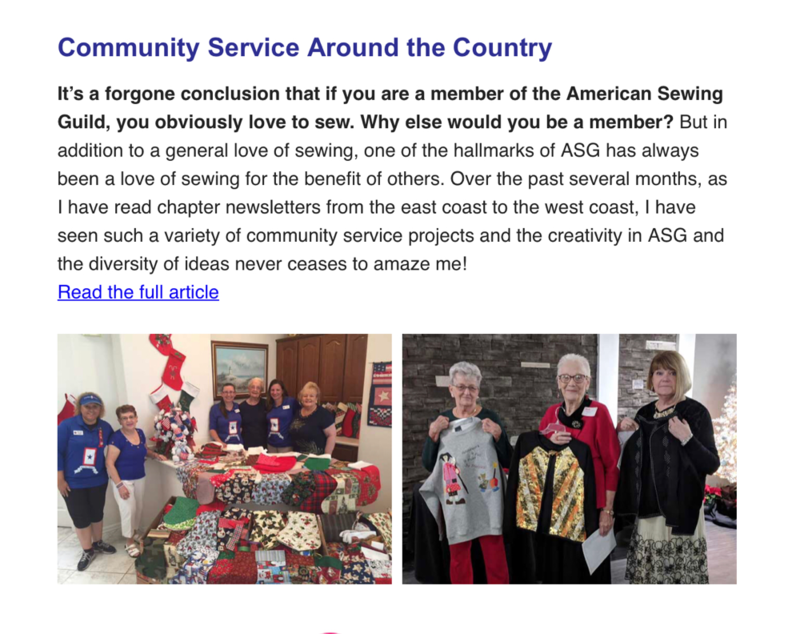 Anyone can sew up items, not just ASG members. If you are not able to attend NG meetings, consider working at home on your NG's 2019 project. We will arrange to pick them up from our members. Non members can deliver their items to our NG meetings. Happy Sewing! Members make hundreds of kits to introduce children to sewing on machines and guiding them through to project completion. They support our youth summer sewing camps by cutting out their classroom kits. Join them during their May meeting- extra hands are always welcome in creating the Summer Youth Camp kits. Members are involved in a few ongoing projects. They make pillows for the Manatee County Hospital Breast Care Unit. These specialty pillows are used by patients undergoing breast biopsies and procedures. They also sew up totes and pillowcases for Manatee County Young Life. Young Life is a faith based organization that helps adolescents grow spiritually in an environment of caring adults. They offer fun activities where teenagers laugh, try new things and hang out with their friends. A third project of P&N is to make ditty bags for Hope Family Services. Members are making infant layettes and toddler clothing for the Englewood Home for Mothers and the Venice Area Pregnancy Care Center. VAPC was founded in 1995 by Bishop John Nevins to help families in Sarasota county provide safer, happier and healthier lives for their children. Currently they serve 600 families, with 1500 children up to age 5. The Layette Program is open to anyone needing assistance and provides expectant parents with a portable crib and layette. Making layette and children clothing items means you can sew as much or as little as you like with no looming deadlines. You will find a lot of free, downloadable patterns and tutorials on the web by searching for the item you are interested in. These sites will get you started: All Free Sewing, So-Sew-Easy, Sewing Support, All Crafts, Sewing Freebies, and Lil Blue Boo. This will be a fun project. Baby items can't help but bring a smile to your face and we can "ooh and awe" over them when you bring them in. Bibs, flannel receiving blankets, diaper changing pad (quilt or other) to lay on bed or floor to change baby, burp cloths and shorts (size 18-36 mo) and toddler (sizes 3-5). (Note: They get plenty of shirt donations, but not shorts). Members are making totes for the Sarasota area food banks. Needy families use them to pick up fresh produce, breads and canned food items. Members are also involved with sewing Kidz Quilts at the Fruitville Library each month. The quilts are sent to children dealing with trauma and disasters. Please keep track of your hours, items and costs by using the Community Service Form or turning them in to your NG Leader or our Community Service Chair, Jan Loy.